SharkScope Desktop combines the power of the SharkScope tournament results database with advanced statistics generated from your own hand history files as you play to give you an unprecedented amount of information both at the tables and for post-game analysis. It can also be configured to work as a light weight companion piece to an existing Hand Tracker, adding SharkScope ratings to your table overlays. Read more here. Try playing online poker with a HUD (head-up display) and you’ll wonder why you ever played without one. SharkScope Desktop’s HUD shows player ratings from the SharkScope tournament results database combined with statistics generated from the hands played by each player whilst you are at the same table. Get started with the HUD here. Through the SharkScope Sync feature, using the Desktop ensures that no tournament will ever be missed from the SharkScope Database and that you can filter your hand history statistics by advanced tournament flags such as Turbos or Deep Stacks. SharkScope Desktop uses accumulated data to find the mathematical errors in your game so that you can eliminate the persistent errors in your playing style. Better still, it helps your find the mathematical errors in your opponent’s games so that you can exploit the persistent errors in your opponent’s playing styles. 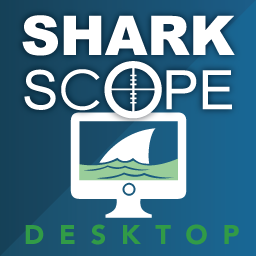 SharkScope Desktop integrates seamlessly with your desktop and your online poker programs. SharkScope Desktop works with PokerStars, Full Tilt Poker, Winamax, Merge Network, 888 Poker, PartyPoker, iPoker (Windows only) and Revolution (Windows only). Read how to configure your poker room. Even though SharkScope Desktop is a powerful application, it is easy to use. The most significant statistics are always viewable. Charts and tables are logically grouped and always within quick reach. Our leak detectors bring all this information together in an instant report. Read about the leak detectors here.